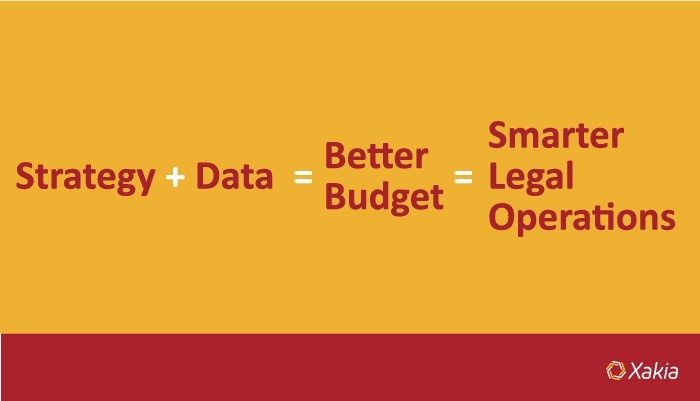 Use Legal Data to Improve Your Budget - and Strategy. It’s not uncommon for the annual budget process to be the only time a Legal Department gets to dedicate time to planning: Recall that nearly half of in-house counsel say they spend too much time “fighting fires” to achieve any long-term goals. In simpler terms, your budget is where strategy gets done. As you prepare next year’s budget, think beyond “last year plus five percent.” Collecting and analyzing some simple data will help you not only forecast your financials, but refine your corporate legal operations. This is likely the largest portion of your budget: Law firms account for 49.3 percent of law department budgets, with non-law firm vendors taking another 5.2 percent, according to the latest Altman Weil Chief Legal Officer Survey. It’s essential to make sure you are spending these resources appropriately. Costs relating to must-win activities. Examples: developing a dispositive argument that resolves the entire case, obtaining a physical demonstrative that makes arguments easier to understand, providing damages or other discovery early to accelerate settlement discussions. Table Stakes. These costs include “competitive necessities” needed to keep up with rivals. Examples: investigating the background and motivations of the opposing side, retaining a damages expert for a major case, or using an IPR to invalidated an asserted patent. Lights On. These are the costs you need just to operate. Examples: responding to pleadings and motions, collecting discovery, appearing at scheduled hearings. Not Required. As the name suggests, these are unnecessary expenses. Examples: developing alternative theories your business won’t pursue, completing work prematurely, engaging outside counsel in the wrong level of work. Is your department paying premium rates for work that’s simply ‘lights on’? Are one or more of your firms spending too much time on work that’s not required? Once you have this kind of intel, you can talk with your firms in advance about the year ahead; set boundaries and limits on less valuable work; and better predict spend. There are more opportunities to align your external spend with your strategic direction; we’ll explore this topic with a special guest contributor in another post. 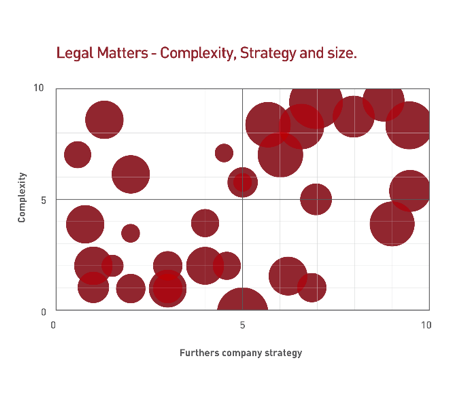 If you’re familiar with Xakia, you will recognize this chart, which maps a department’s legal matters by complexity and strategy: How challenging is this project, and how important is it to the company’s objectives? If the size of each circle is proportional to the dollars at stake, or the resource intensity, you can add a third dimension. Complex + Low Strategic Value: In the upper left quadrant, matters are legally complex but not strategically significant. Budget considerations: Is there a pattern to this work? Are we paying too many firms to “relearn” this work when one boutique may handle it more expeditiously? Simple + Low Strategic Value: In the lower left quadrant, work is routine and low-risk. Budget considerations: This category may have the most potential for budget impact. What could be automated? What could be bundled to an inexpensive firm or LPO? What types of projects could be eliminated altogether with “self-help” tools for business clients or just basic training? Simple + High Strategic Value: In the lower right quadrant, matters require familiarity with the company’s strategic goals. Budget considerations: What could be insourced to a paralegal or junior attorney? If outsourced, should the work go to one or two firms to cultivate institutional knowledge? Complex + High Strategic Value: Your most exciting work is in the upper right quadrant; it’s also likely to be the most expensive. Budget considerations: What are the company’s strategic goals in the year ahead, and are we adequately funding these projects? Are we adequately staffed for this work? Starting the budget process with a strategic look at both your external spend and your internal workload will result in a better financial picture, to be sure: You’ll align your law firm spend with actual value, and you’ll demonstrate to the Finance Department that your budget is more than guesswork and rounding. But better yet, you’ll enter the new year with new, informed ways to deliver more value to your business and a commitment to make them happen. Ready to get started? Our white paper and sample legal department budget will guide you through the budget process, from staffing to disbursements to contingency fees.